Would you believe me if I told you that in a recent sales force evaluation, nearly 50% of the 300 inside salespeople were not in the right role? Recently, we evaluated a large inside sales force and I thought it might be interesting to share some of the more unusual findings that were responsible for this sales team's inability to achieve the revenue goals that the company expected from them.It isn't uncommon to learn that salespeople are not in a role for which they are best suited, although it isn't as easy to determine in sales forces when there may be only one role - like territory sales. On the other hand, when we evaluate a company with multiple selling roles, our analysis will identify the best role for each salesperson and, as I mentioned at the outset, most on this sales force were not in the right selling role! This particular sales force was interesting in other ways too. 100% had strong Outlook (we never see that even in much smaller teams), 92% were Coachable and 82% had strong Desire. As good as that sounds - and it is very good for a large sales force - 47% lacked Strong Commitment. I wrote an award-winning article about the difference between Desire and Commitment here. Understanding the huge difference between their Desire and Commitment levels, it should not surprise you that the sales managers mirrored the salespeople with their Desire and Commitment scores. You won't have any difficulty determining whose teams had most of the salespeople that lacked Commitment. 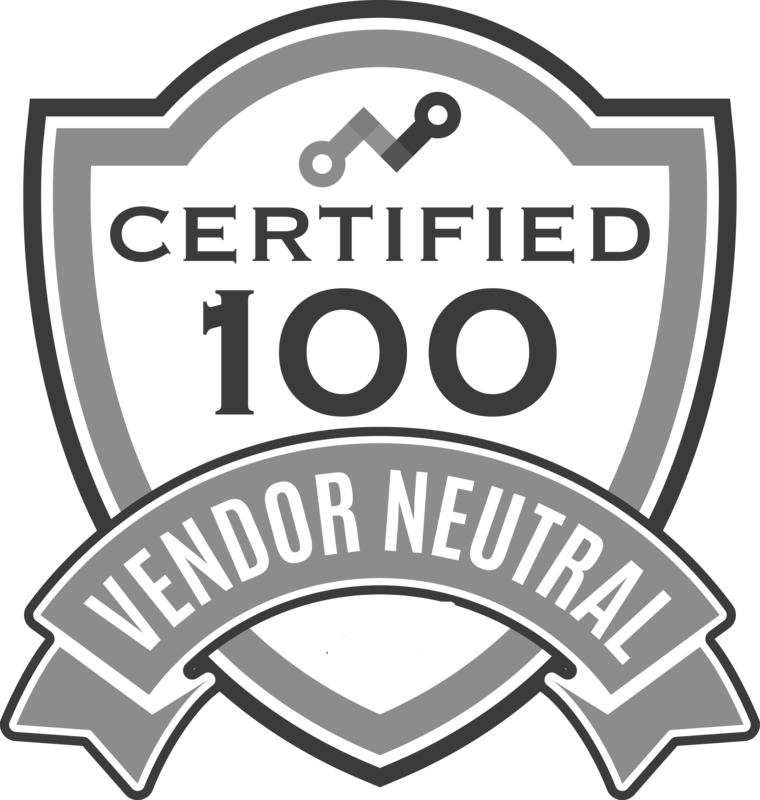 A big part of almost any inside sales role would require finding new customers and that was true with this company. I'm going to share one of the most interesting findings from the evaluation. It is symptomatic of the Commitment problem and is one of the reasons as to why so few of their salespeople were in the right role. In the image below, you'll see that there was a near-even distribution of the four groups into which we categorize salespeople when it comes to finding new business. And in case you aren't sure, even distribution in this area is not good. 21% will hunt for new business without being asked. 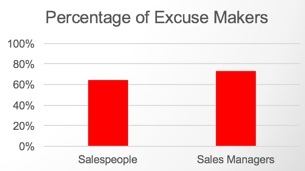 30% would hunt for new business if their sales managers held them accountable. 24% will follow up on a lead, but won't engage in proactive hunting. 24% will not hunt, no matter what, ever. Training and coaching will not change those percentages, but will improve the skills of the 51% that do or would hunt. 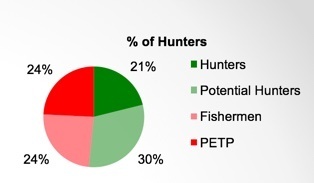 The percentages are reflective of their Sales DNA which, in this case, does not support hunting activities. 48% of them lack the Sales DNA which supports hunting for new business! That explains a lot, doesn't it? This company had a well-known value proposition - you've undoubtedly heard it - but they recently changed it. The image below shows that their salespeople were generally not using either the old or the new value proposition in their selling! Here is a link to a very short article and video where I explain the huge impact of excuse making. I'll share one more of the many interesting findings from this evaluation. 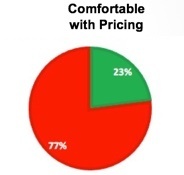 Notice from the image below that despite the fact that this company positions itself as providing value, most of the salespeople are not comfortable with their pricing. The majority believe that they must have the lowest prices in order to succeed. 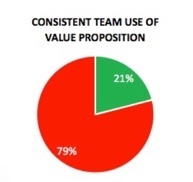 The sales force is out of alignment with the company's value proposition!! Here is a great article that describes how quoting prices undermines selling value. These examples are just 5 out of dozens of interesting findings that we shared with their executives. Without learning about these issues, they would have continued going down the wrong path and expanded the sales team's general ineffectiveness. Read about the impact of scaling sucky sales. What about your sales force? Do you have the right salespeople in the right roles? Are your salespeople actually capable of executing your plan? Can they provide the growth that you need them to achieve? There are two ways to find out. The first is to wait 12 more months and measure results against expectations. How has that worked out in the past? The second way is to evaluate your sales force and learn how their capabilities align with your goals, expectations and timeline to discover what, if anything, needs to change. 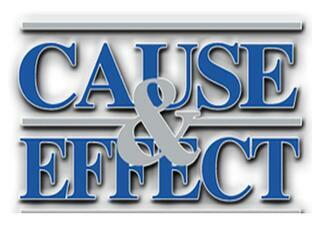 Learn more about a sales force evaluation here.